Soul: "SurfSisters' Home and Background"
I am a true Aquarian who loves to be by the ocean, who needs the smell, sound, view, taste of the never ending rolling ocean waves... and only since recently, I need the feel of the waves, too:-)! Originally from Germany, I wouldn't have turned into a surf chick, if I hadn't moved to beautiful Australia about three years ago. Having been a sportswoman all my life, here, it was inevitable to get in contact with surfing! And yes, at the age of 53 I fell in love with it. I am still a novice out there on the waves but enjoy it with all my body and soul. It is the most intoxicating sport and way of life. 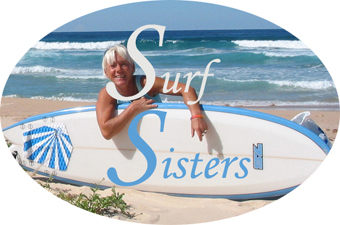 I want to share my passion for it; that's why I am "sistering" www.surfsisters.de and www.surf-sisters.com. I am very much looking forward to networking with other girls and women surfers and hope you will send contributions to this site. The editorial staff reserve the right to edit and/or shorten contributions before publishing them. Reports marked with the author's name do not necessarily represent the opinion of the editorial staff. The surfsisters editorial staff do not assume responsibility for the contents of external links.